Life Coaching with Napoleon–Dynamite, that is. Napoleon Dynamite. It’s been seven years and I still laugh at this movie. I have it on DVR so I can speed through to favorite moments. A friend and I were laughing as we sent quotes back and forth this week. His dialogue is so painfully true to life. I knew kids just like him, and he talks like them. The humor is not cruel, slapstick, humiliation or vulgarity–it’s recognition and insight into irony. You feel the pain and wince because you’ve been there as one of the characters in that movie. 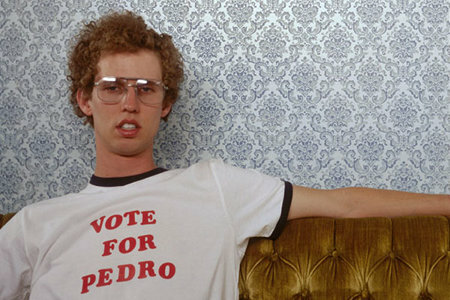 Napoleon Dynamite: Stay home and eat all the freakin’ chips, Kip. Kip: Napoleon, don’t be jealous that I’ve been chatting online with babes all day. Besides, we both know that I’m training to be a cage fighter. Napoleon Dynamite: Well, nobody’s going to go out with me! It’s the little details–Don the Jock, mocking and threatening but never actually doing anything but sneering and shaking his head; the bully who kicks Napoleon’s pants to mash his “tots” when he refuses to share them; the kids in the bus screaming when Lyle shoots a cow without thinking about who’s watching; the town rich girl who always wins everything because she was entitled from the get-go and the faceless mass of kids who never have a chance. Then the principal—lecturing Pedro for his “cruelty” for mocking his opponent with a piñata and later leering at the Happy Hands dancers do their skit bare-footed at the assembly. I could go on. Napoleon grabs onto a new kid from Mexico in the desperate hope for a friend who might stick by him. I winced. I was that kid. I spent most of my life as an outsider, since I moved throughout childhood. I attended seven different school systems in five states before I graduated high school due to my father’s job. I get “not belonging.” I had to fit in and figure out a world others created, often obliviously, before I arrived. I am actually grateful for these experiences. Any capacity I have for empathy and compassion owes a lot to this experience in my life. While America is throwing trillions around I think we ought to move everybody in the country at least once, some of us to a foreign country, for at least a year so we can grow up a little and have some informed opinions. The lack of imagination, openness to others and real knowledge of what it means to be “dislocated” probably has a little to do with our trivial politics and fear-based anxieties about the rest of the world. Once you’ve been the powerless, unimportant and an outsider, you never see life the same again. Posted on December 15, 2011, in Art, Children, Christianity, Competition, Culture and tagged change, delicious bass, friendship, life coaching, marriage, movies, Napoleon Dynamite, openness, outsiders, Pedro. Bookmark the permalink. 2 Comments. Is that the same as “jack of all trades…”? Thanks! !